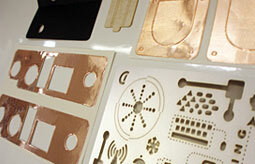 Cellotape goes beyond graphic applications to provide you with complete solutions. With over 25,000 tools (class A, steel rule, and rotary) and with our digital laser converting capabilities, we can cut complex shapes and meet extremely close tolerances; our capabilities include trimming, laminating, sheeting, and slitting. Our close relationship with material suppliers such as 3M, Bayer, and GE give you access to an enormous selection of substrates, foil, foam & rubber, adhesives, inks & coatings, liners, and laminates, to fulfill all your component needs.